Natrol Biotin Reviews - Some Reporting New Hair Growth! If you are looking for a solution for hair loss but don’t want to spend too much, the number 1 recommendation by most dermatologists is totake Biotin. Why? Biotin is an essential hair vitamin. Its primary role is to support the health of your hair and nails to promote proper growth. Put simply, it provides a piece of nutrition your hair needs. There are many brands to choose from, but if you are looking for the maximum result, Natrol biotin is a good option. Natrol Biotin has been one of the best sellers on Amazon for a couple of reasons (Currently, over 10,000 reviews!!). First, it costs less than $10 for 100 tablets (which is contained one bottle). As you only need to take it one tablet a day, it will last more than 3 months. In other words, it only costs about $3 per month. Second, each tablet contains the maximum strength of 10,000 mg. 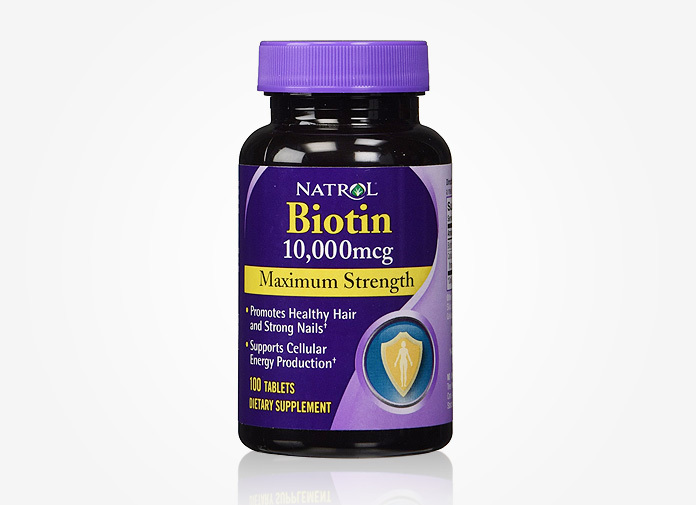 Since biotin is water soluble, you can’t overdose on it since your body will naturally remove any excess amount. If this is your first time trying biotin and still worried about the high dosage, try Now biotin instead since it comes in a few dosage options. Find the level that suits you best. Even though some people take biotin for faster hair growth, it is more popularly used by people who have thinning hair along their hair lines or bald spots. Biotin for Hair Loss: A large number of reviews mention that after taking Biotin from 6 to 8 weeks, they did see their bald spots were filling in with new hair. Make sure to check customer photos on Amazon. Before and after transformation for hair regrowth are truly amazing! Also, a number of users noticed thicker and fuller hair after taking biotin. (Keep in mind the noticeable difference started from 6 weeks of usage. In other words, you can’t expect instant results with hair vitamins like Biotin). Some people have commented that they didn’t see great results – they noticed their hair growing faster, but when it comes to hair regrowth, biotin wasn’t the optimal solution for them. Biotin Side Effects: Other reviewers say that biotin gives them cystic acne and increased breakouts on their faces. One way you can avoid acne is to drink lots of water (at least 4 glasses a day). This will make it easy for your body to flush it through the system and clear up any existing skin breakage. How is your experience with Natrol Biotin? Please share in the comment.